The amazing journey of Xiao Sa is no shaggy dog story. The small stray dog latched onto a group of touring bicyclists in central China and followed them all the way to Tibet, a distance of some 1,000 miles. One of the most scenic rides in the US is open to traffic, including bicycles. 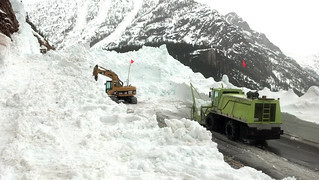 The North Cascades Highway opened at noon today after state highway crews spent the past seven weeks clearing away snow nearly 60 feet deep. 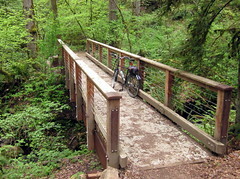 A unusual sunny Sunday in Seattle made the first Bicycle Sunday along the shores of Lake Washington a rousing success. As it has done so for years, the city closed down a 2 1/2-mile stretch of Lake Washington Boulevard — between Seward and Mount Baker parks — to vehicular traffic and turned the street over to bicyclists. Eleven more Bicycle Sundays are planned this summer. A new 7-part public television series that examines bike culture in North America begins Saturday in some major cities, just in time for National Bike Month. “Pedal America” is hosted by Ira David, a New York City native and avid cyclist who has criss-crossed the country many times on his bicycle to benefit charities and causes in the past. Beware of bicycling; it can be habit forming. That what I concluded as 30 Days of Biking came to a close today. The scheme was hatched by some cyclists in Minneapolis to get folks out on their bikes in April. 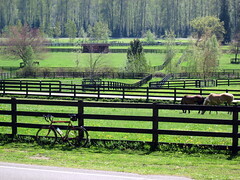 Even though I’d been riding all year, I knew there were plenty of dates in April that I wouldn’t get to ride. I had to use a little ingenuity, but I only missed one ride the entire month. A California motorist who is suspected of striking two bicyclists in Berkeley and speeding away has been arrested by police after a bike-mounted video camera captured his license plate number. What’s the best way to be an ambassador for bicycling? Simply go out and ride your bike. That’s what I’ve been doing for all but one of the “30 Days of Biking” the past month, and that’s what I plan to do for the National Bike Challenge, which starts Tuesday and last through the end of August. The idea, unveiled in March at the National Bike Summit 2012 in Washington DC, seeks to sign up 50,000 people as individuals or team members to ride their bicycles 10 million miles from May 1 to Aug. 31..
Are bike path bollards an unnecessary hazard? Whenever I used to come across a bollard in a bike trail, I’d get the righteous feeling of ownership that this was my trail; cars cannot get in. Now I worry that a bicyclist might hit the bollard and suffer an injury. Are bollards safe? Not always. Experienced bicyclist Giuseppe Maino, 53, died from injuries he suffered when he struck a bollard on the Richland B&O trail in Bellville, Ohio, this week. A 75-year-old man who repairs and sells used bicycles from his home in Portsmouth, N.H., is fighting a cease and desist order from City Hall. Tony Tzortzakis has been ordered to shut down the bicycle business after a neighbor complained about him storing and selling bicycles outside his home. ….